Essie Lotions + Fill The Gap - Cherry Colors - Cosmetics Heaven! On Saturday I was waiting for my Essie pack from carodejka.. But noooo, it didn't arrive even if it was sent the day before. 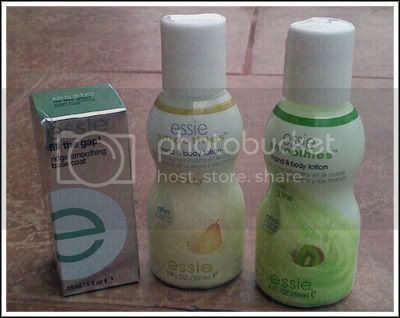 Anyhow I got it today and in it were two small Essie hands/body lotions and Fill The Gap. Both the lotions smell really fresh. I think I'll be using them as hand lotions in the summer, when I'll get bored of all the sweet smelling hand lotions. I won't use them as body lotions, simply because they're just too small for that. 59ml of pure cuteness! They were about 3€ each, cute but a little pricey. If I'll like them, I'll get the big one. I tried it already and it really fills the ridges/gaps. I expected only that from it and it does its job well!